E.R. 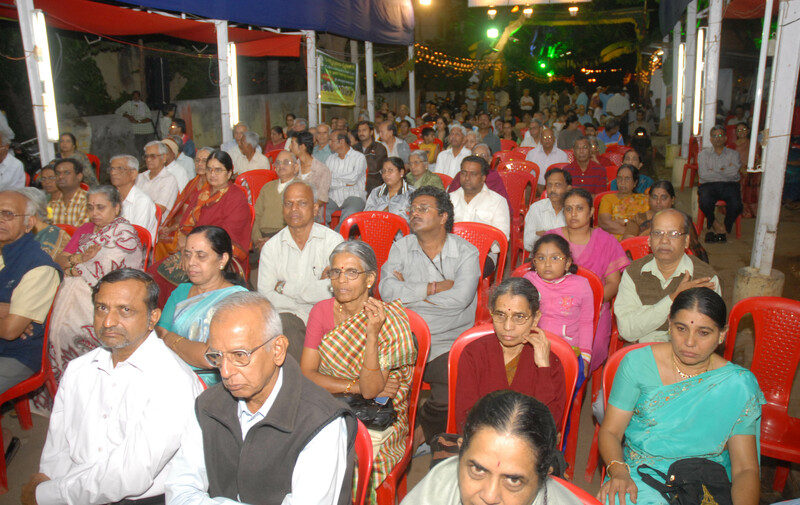 RAMACHANDRAN writes: The 49th music festival of Sri Prasanna Vidya Ganapathi Mahotsava Charitable (SPVGMC) Trust—popularly known as Vontikoppal Ganesha music festival; still more endearingly called ‘8th Cross Ganesha” by Mysoreans across the world—is underway in Vani Vilas Mohalla in Mysore. In itself, this might not strike non-Mysoreans as anything remarkable. But, hang on, there are so many ironies that abound here. One, this is no ordinary music festival. This is not your usual “orchestra” belting out bawdy film numbers. This is a classical music festival, as classical as it can get. Two, a small stretch of a road no more than 100 metres attracts some of India’s biggest names year after year to show their wares. And three, ordinary people get a ringside view of the action for free. “8th Cross” artistes span generations: Dr N. Ramani has performed here. So has his son Thyagarajan. So has his grandson Atul Kumar. “8th Cross” artistes span genres: Carnatic is par for the course, of course. But Ronu Mazumdar comes here to play the bhansuri. Pandit Vishnu Mohan Bhatt comes here to play the vichitra veena. “8th Cross” artistes span cities: Mysore Manjunath and Mysore Nagaraj (violin) and Mysore-born N. Ravi Kiran (gottuvadyam) are regulars as many homegrown artistes are, but N. Rajam comes here from Benares. Kadri Gopalnath (saxophone) comes from Madras. As does the vocalist and harikatha expert, Madurai T.N. Seshagopalan. There is the possibly apocryphal story of M.S. Gopalakrishnan going into a shell long years ago—not doing concerts, not meeting anybody, not appearing in public. SPVGMC functionaries somehow landed up at his residence and the legendary violinist was soon unveiling his magic in front of coffee pudi angadi on “8th Cross”. In short, for those who lament the passing away of classical music, the flood of top-quality music on “8th Cross” , bang in the middle of the road, is a reminder that even nostalgia is no what it used to be. And it’s not just the oldies. Young engineers and doctors who learnt music in the lanes and bylanes of Vontikoppal, also get a platform to show their “offline” skills. On Saturday, a group of IT engineers gave a ‘venu-veena-violin’ performance. Then there is Pandit Rajeev Taranath, disciple of Ali Akbar Khan, who performed a jugalbandi with Mysore Nagaraj on the violin. Taranath, who holds a PhD in English literature and has written acclaimed critiques on Shakespeare’s works, threw it all and went to learn sarod from Ali Akbar khan. What makes the 8th Cross Ganesha music festival so special? For one, it is the respect which comes with age. And for another, it is “taste”. But a key reason has to be its location in the mind’s-eye of residents of Vontikoppal, Jayalakshmipuram, Gokulam. Like the Tour de France, a sport which comes to the people rather than people going to it, the artistes come to 8th Cross, to where the people live instead of the people having to go to an auditorium to hear them. For 15 days, the little street is off-limits for motor traffic. Working men and women return home to find some superstar playing in front of what used to be Naganna-na angadi. City buses, with a pivotal stop at Shanku‘s bakery behind where the idol is installed, rev up to raga alapana and swara. Life still goes on amidst the music. As the singers and artistes take their positions after a namaskara to the diety behind and the audience in front, the programmes invariably start on the dot (6.30 pm) with a varna. With monsoon on the way out and winter on the way in, the elderly come armed for both: an umbrella and a sweater. Africans studying in Manasagangothri hop over to Just Gelato; American and European yoga trainees flock to Hotel Authana or The Sixth Main. Chinese students staying in Paduvarahalli cross over with their cycles. 8th Cross is a veritable Global Village. As the singer warms to an alaapana in Kalyani, children from Matru Mandali school in their uniforms cross “8th Cross” after practicing their programmes for this year’s Dasara. Next, tiny tots in their karate attire pass through the footpath trying their latest chop on anybody who comes in his way. When it is nearing 8 o’ clock, a couple of elderly men furtively take a small walk to the vacant plot behind Amba Bhavan to ease themselves. As the artist start their main raga in Ananda Bhairavi, yoga students, while walking through, grab some chairs sit mesmerised by the music and postpone their dinner at Green Leaf on Kalidasa Road to 9 0’clock and beyond. Around 9.30 pm when honorary secretary C.R. Himamshu, grandson of the legendary violinist Piteelu T. Chowdiah, stands up to felicitate the artistes, a couple of Iranians, unrecognisable without their Hayabusa motorcycles, walk through to the Austrian cafe, Edelweiss, after buying Iranian bread from Loyal World on Temple Road. Around the same time, granddaughters and grandsons on their Activas and Scootys arrive to take home Ajji and Paati, by now fully wrapped up in shawls and mufflers. Since the singer has just now started their eternal favourite thukkadas like Krishnaa nee begane baaro, Venkatachala nilayam or Bhaagyaada lakshmi baramma, generation next has to wait a bit longer. Finally when it is time for mangala, Pavamaana in Raaga Souraashtra another day, another evening of music has gone into the soul as the crowd wade through to take prasada and leave home. The 49th year is perhaps just as it was in the first year; same raaga, same devotion, same enchantment. Only the artistes are different. It goes on like this in Vontikoppal. And sometime around Dasara, donors and sponsors, regardless of the size of their contribution, will get invited to a business-like oota at Eswarana devasthana (Eswara temple) on Adipampa road for making this year’s musical bounty possible. Soon, it will be time for next year, the 50th. This entry was posted in Kannada & Karnataka, Music, Films, Television, Mysore-Bangalore and tagged Ali Akbar Khan, Churumuri, Kadri Gopalnath, Madurai T.N. Seshagopalan, Mysore Manjunath, Mysore Nagaraj, N. Rajam, N. Ramani, N. Ravi Kiran, Piteelu Chowdiah, Rajeev Taranath, Ronu Mazumdar, Sans Serif, SPVGMC, Star of Mysore, V.V. Mohalla, Vishnu Mohan Bhatt, Vontikoppal. Bookmark the permalink. ← CHURUMURI POLL: Who will win Ayodhya title? Beautiful. I grew up close enough to ‘Vontikopplu” to consider myself almost a resident of the locality. While the main roads are smothered with commercial buildings now, the interiors of the locality, (conservancies, old houses and all), probably makes it the most charming residential layout that I’ve ever seen. As kids, the “paalu biddiro mane” near 8th cross close to the music festival pandal was one which in our fertile imaginations was haunted by ghosts. We were scared enough for the school van to fall silent – for a few seconds – as it passed the ruins every morning! Unfortunately, the Ganapati festival in Gokulam 3rd Stage (on the maidana near Doctors’ Corner, almost next to Nanjundeshwara Stores) was known for all the reasons that this one isn’t. Super, super, super… Thanks, ERR! Such great musicians at this festival and wonderful atmosphere. I am so glad to hear the fantastic playing of Pt. Rajeev Taranath who has somehow not been present at this festival to my knowledge before. Beautiful! A memorable event all round. I travel from Bangalore for this. Excellent sir. Narayana Shastri Road in K.R.Mohalla, Banumayya chowka and Prabhudeva talkies circle were also quite famous and well known for “Ganesha celebrations” during 70’s. I remember, orchestras of Kalinga Rao, Cheluvaraj, Harikathe of Gururajulu Naidu, Bhadragiri Achyuta Das and Keshava Das, etc. used to draw huge crowds from Subbarayana Kere to Marimallappa school on Narayana Shastri road. Nowadays, I don’t know how it is. 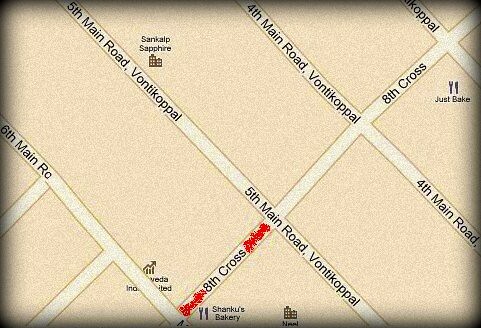 I can never forget the 8th cross, Shanku Bakery and the Ganesha, which is popularly known as “8th cross ganesha” in Vontikoppal and surrounding areas :). shanku bakery , 8th cross ganesha – also add “ambi” to the list :) . This article brought tears to my eyes! I lived in JL Puram and went to Matru Mandali and even learnt classical music from Smt. S.K. Vasumati who still resides very close to 8th cross. I left India almost 30 yrs ago and this article reminded me of those wonderful evenings spent listening to music and trying to identify the ragas as we were kids still learning music. Familiar names like Himanshu are such music to our ears. I still have the autograph of Sri Ramanathan in my music book. I recall attending the great Semmangudi at this same venue. I hope to visit Mysore during Ganesha festival one time and revisit this wonderful festival. Can’t thank you enough for rekindling these nostalgic memories. `Brahmins need a deeksha to awaken empathy’ – I got attracted with the caption which has relevance socially in every walks of life when evaluated. I an an ardent lover of carnatic music which needs hardly any explanation in the present day world. Having lived in Chamarajapuram from 1968 till 1995, such concerts during Rama Navami and Ganesha Chaturthi were regular affairs. You name the stalwart in any type of music (vocal or instrumental), we have heard the concert live. Besides, we used to attend concerts near Padma talkies, Halladakeri, Banumaiah Chowka, Bidaram Krishnappa Mandir & KR Circle. At times it used to be difficult to make up our mind as to where to go on a particular day as all were stalwarts! The live concert by MSS at Banumaiah Chowka during early seventies was a total sell out. So were the shows by MLV, Ramanathapuram Santhanam, Lalgudi Jayaraman, Ramani, Mahalingam TR to mention a few. The show by P Kalinga Rao at KR Circle is still fresh in my memory. It is nice to know that VIII cross VV Mohalla have continued with the tradition and getting famous artists of the current era. Cheers to them!! Very helpful :) Thanks and all the best. As a student of Sharada Vilas College in the 60s, I was fortunate to live in Mysore for a couple of years. As a warder in a hostel, I had sufficient freedom to move about. The love for music was taking me and some of my friends to Aralikatte and Bidaram Rama Mandira, during the music seasons. Rama Mandira had an entrance fee, which we did not have. So we used to listen to some glimpses of music from stalwarts of those days, standing outside, getting orders from the authorities to go away from that vantage point. I remember one day I was called in by a gentleman to listen to music directly. I don’t know his name. But, that day I was a hero among my friends, as I had entered the arena. To day I live in Mysore. After fifty years, reminiscing the nostalgic memories of those days and our travails to listen to music bring smiles amongst our group. As a music critic, today I am being offered the front seat. I listen to music of all who come to Mysore and the local artists. But the thrill of getting a glimpse of the Vidvans walking into the Rama Mandira and listening to a bit music in a stolen moment is unparalleled. ERR has evoked many of my memories associated with Music and Mysore. Many thanks to him. Today the magic of 8th cross Ganapathi music festival has cast a spell on me and it is one of the great places for oldies like me. The yeoman service, Himamshu is rendering to the field of Music is an oases in a desert. Ganapathi homa by chalakere brothers and the nadaswara recital from muslim couples were the highlight of the year 2013. Some many photo graphs will be captured every year during the concerts ,hereby requested to upload those in their website.